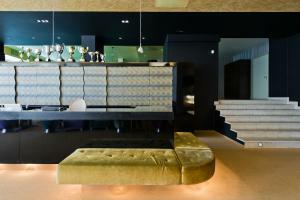 You can enjoy your free time playing bowling, billiards, pool or darts, next to the impressively designed café. S ix bowling tracks were set by the company „Brunswick“. 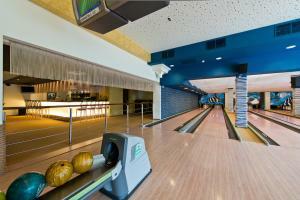 The tracks are up to all standards, so it is possible to organize official bowling competitions here. The bowling tracks have special uplifting sides, which make the game friendly to children of different ages. Bowling is a perfect place to organize your staff party – tournament with an event organizer, special program, snacks and drinks. 3 pool tables certified by European Pocket Billiard Federation (EPBF) and one Russian Billiard table (Rus Pro Tour) certified by European Committee of Pyramid(ECP) are for our guests and their games. 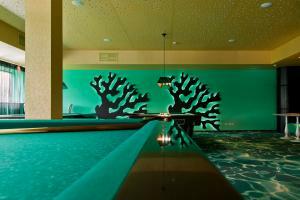 The Russian Billiard table satisfies the requirements for the equipment used in professional championships. You are welcome to try your accurateness in the game of darts. An oval board is fixed to the wall and one has to throw darts trying to hit the target. 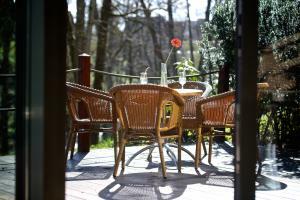 It is great to spend time in an outdoor café terrace, enjoying the views of the Ratnyčėlė valley, having a cup of coffee or tea, milkshakes, trying pizzas and snacks with a glass of beer or wine. If you are into active sports, you are welcome to play table tennis. An active racket sport is played with light balls on a special table.